Rachel Yang of Joule, Revel, and Trove in Seattle, Washington. Photo credit: Jackie Donnelly. 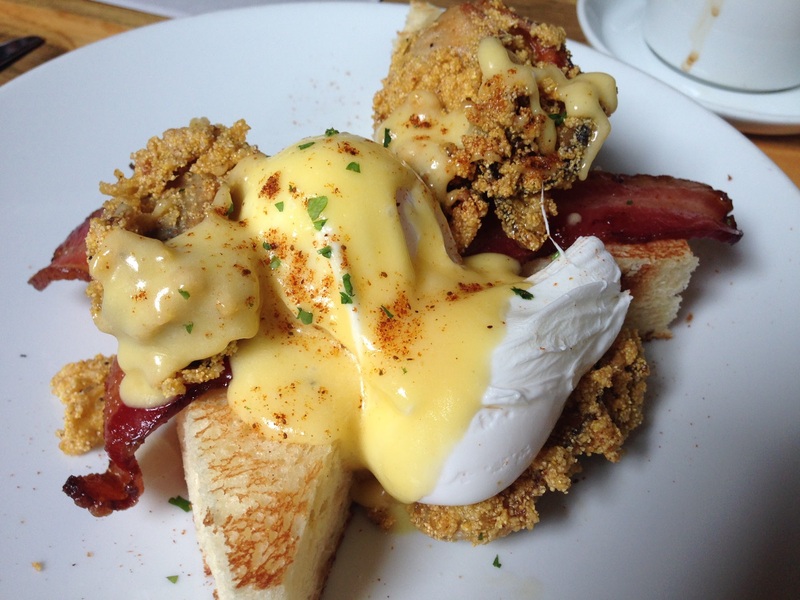 What do you love best about Seattle’s food scene? It’s the kind of standard and accountability of the products and produces that you have here. I think that’s the biggest thing that elevates the entire dining scene. Everywhere you go to, you can count on having great purveyors, great produces, great meat and fish and all that stuff, and that’s kind of a standard that’s hard to see in a lot of different cities. Name the top restaurants and dishes that you think every visitor in Seattle should try. RockCreek is great. They have great seafood. Pretty much anything that you order on the menu, you’ll be surprised by how big and bold the flavor is. People are used to having tamed down, watered down seafood dishes, so that’s really great. My neighbor, The Whale Wins, they have really some of the best pickled and roasted vegetable dishes you can think of, so they’re awesome. I do love a new restaurant called Manolin. They opened probably three or four months ago. They have such clean-flavored dishes that are just really interesting. And I actually really love Tom Douglas’s Serious Pie pizza. He definitely has great people working for him, his food is always solid, and the pizza’s great. Describe your perfect “dining out day” in Seattle. For a light pastry [for breakfast], you’ll definitely go to Besalu, which is a place down in Ballard that has amazing croissants and Danishes and stuff like that. Or if you want [something] a little bit heavier, Wandering Goose is a great place to get full-on biscuits and all that stuff. But I remember, their biscuits are so amazing, but after you eat it, you can kind of feel like you ate a whole pound of butter, which is a good and bad feeling (laughs). Lunch, just kind of keep it light. My husband and I actually sometimes go down to International District and then go to Mike’s Noodle, where they sell congees. Congee’s just one of those things, gosh, you can get anything you want from fermented eggs, to beef balls, to whatnot. When it’s in that silky sweet kind of porridge, it just makes everything taste so good and we love that. That would be our perfect lunch date spot. If you were to have a fancier dinner, definitely I think go to Westward. People often laugh at going to a waterfront restaurant, but I think they definitely did a great job of making people think twice about tourist restaurants because it has become a quintessential Seattle spot. I love desserts, and this is one place I’ll definitely recommend, even though it’s my place. Finish your meal with parfait at Trove. That’s exactly what we did yesterday. It was our wedding anniversary a couple of days ago, so we went out to dinner at Lark, which is great, but then we were like, “We have to have a parfait to finish off the meal,” so we just drove down on the way home to share a parfait and it was just perfect. Right now, they have three different flavors: one is mud pie, one is strawberry shortcake, one is creamsicle. The mud pie is done a new-school way, which is with a cardamom cake and tahini caramel. It does have some sort of toffee crunchies and it’s pretty awesome. If you had to name one favorite dish from each of your restaurants, what would they be and why? 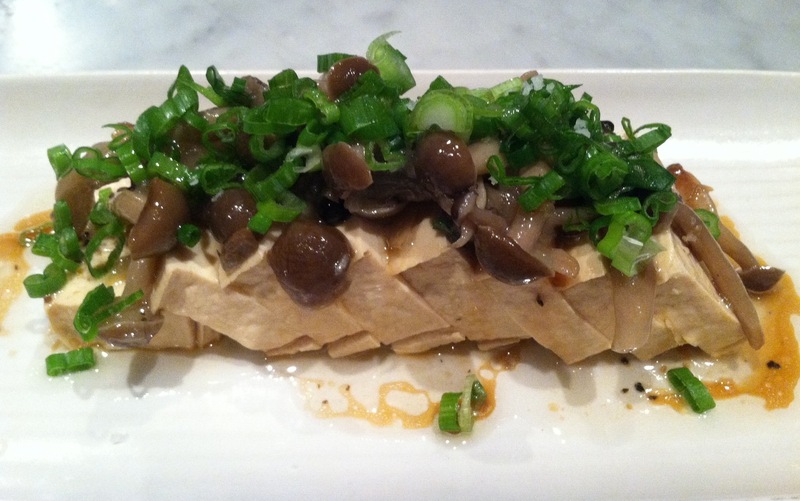 Smoked tofu with honshimeji confit and soy truffle vinaigrette from Joule. Photo credit: Jackie Donnelly. At Joule, it would definitely be our little appetizer dish called smoked tofu with honshimeji mushroom confit and truffle vinaigrette. It’s one of those dishes that people who don’t normally like tofu or are very put off by having a cold tofu appetizer are always just blown away by the flavor profile. It’s a somewhat simpler dish, but just the flavor combination itself works really well. 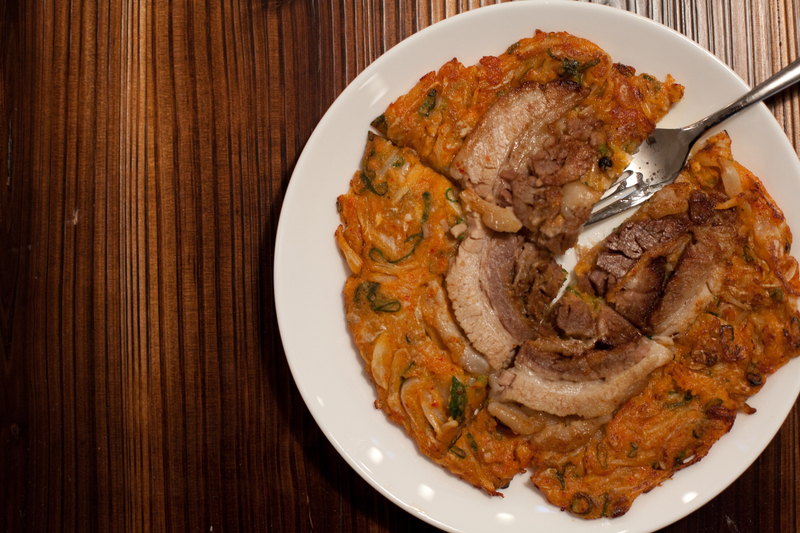 Here [at Revel], it would be our kimchi pork belly pancake. We make all our house kimchis. It’s just something about when you ferment it and then chop it up and put it into batter, it just does its magic. It’s just like a flavor that cannot be ever duplicated by just mixing any kind of ingredients. It’s just that the whole fermentation gives great depth of flavor. It’s awesome. Kimchi pork belly pancake from Revel. Photo credit: Jackie Donnelly. And then at Trove, we actually have this dish that is sort of our take on salt and pepper squid. So it’s basically our calamari that we slice and dip in batter and fry, and it gets served with four different kinds of herbs and chile and garlic, and our little twist was serving it with tapenade. It kind of really shows what our flavor is all about, kind of taking on the classic salt and pepper Chinese-style dish and then by adding another salty ingredient that works really well. It’s just something you can munch on all day. Your restaurants have become go-to destinations for Asian food, but what other Asian restaurants in the city have impressed you? It’s really awesome to see so many Asian restaurants popping up lately. But I think Ma’ono. All the flavors there are awesome. Mark is a great chef there, so that’s been our long-standing Asian restaurant. And even though it is a somewhat traditional sushi place, Sushi Kappo Tamura is just a really great Japanese restaurant where the chef does great sushi, but all their savory hot items are just as good and just as innovative. Stateside, it’s just great flavor, all feel-good kind of vibes and all that stuff. I think it’s great. I think the ultimate place, really, that Seattle was so blessed with was Monsoon and what Eric Banh had brought to Seattle. It was really that pretty authentic, really bright, bright flavor. You incorporate a lot of Korean ingredients into your restaurant dishes. Do you cook a lot of Korean food at home? What’s your personal favorite Korean dish? I don’t think I ever really cook authentic Korean dishes at home. We do a lot of simple stir-fries and stuff. I always end up going out for Korean if I have a craving for something. My two favorites, one is soft tofu but everyone loves that, but the other thing that I really love that people don’t really know much about is seolleongtang (설렁탕). It is that really hard-boiled beef broth that has a lot of knuckles and a lot of cartilages … it’s basically all about the tendons and soft bones and all that stuff. It’s something that people wouldn’t really understand why people would eat those things, but they’re the most awesome food, especially in the wintertime when you’re kind of sick; it’s just like the perfect food. I remember when I was pregnant both times, this was something that I was having cravings for, so I would drive myself up north. There’s a couple of places, but there’s one I go to on Aurora. It’s called 전통설렁탕 (Traditional Korean Beef Soup). Even though we try to focus on Korean food, we really do go over the entire span of Asia. We do a lot of Vietnamese, a lot of Thai. I think those flavors are my favorite besides Korean. Korean food is awesome because of the whole depth of flavor that comes from fermentation unlike any other cuisine that’s out there. But I think the way Vietnamese and Thai people use their herbs and citrus … I think it’s really the love of the acid, just the brightness of the dish is something that you don’t really get to see anywhere else, and it just makes every single flavor pop, so that’s really awesome. I like this place on Phinney called Mai Thaiku. For me, I think it really hits all the notes. It’s very authentic northern style Thai. We actually have fun with a lot of different cuisines and flavors because we do this monthly rotating theme buffet for brunch at Joule, so basically each month, we’ll pick a different cuisine or country and we just have our fun take on brunch items, so last month we did Irish. I learned a lot of really awesome good food that we can do, and this month we are doing Argentina, which we just love. Chimichurris, quinoas and a whole bunch of things like that so we try to kind of educate ourselves and have fun with different kinds of cuisines and it’s awesome. I think it’s actually Capitol Hill. Capitol Hill had its height of craziness about four or five years ago, and right now it’s back to that kind of point where there’s so many places opening, and I think it’s kind of fun to be in a neighborhood where there’s so much energy and people are doing different things. As long as you get there early enough to park your car somewhere, it’s a great place to walk around. Because it’s Seattle, we have to ask: what’s your favorite thing to do in Pike Place Market? Obviously you’ll be completely amused with the whole fish market and the way they throw the fish and all that stuff. But I think if you just kind of lose yourself in the maze of Pike Place Market, you’ll just find and discover all sorts of quirky little stores. I think that’s part of the fun of it. It’s a market that’s really fun to just go in without thinking not to buy anything, but then coming out with bags of different things. Since Eats Abroad is geared toward travelers, are there any restaurants or bars at SeaTac Airport or the city’s hotels you would recommend? At the airport, you can actually get Beecher’s Cheese. That’s fun great stuff to have at the airport. For hotel restaurants, Miller’s Guild is pretty awesome. It’s in Hotel Max in downtown. Are there any foods native to Seattle that you particularly like and that visitors should try to find? I guess you can get it anywhere, but salmon is really big, obviously. People naturally think of salmon to be a Seattle food. But people who have never had salmon candy, which is basically smoked salmon belly … that’s something that if you’ve had just salmon, you have not tasted real salmon. It literally melts in your mouth. It’s a little pricey, but one bite can last for a really long time, and I think it’s the perfect thing to try. Finally, what would you say any visitor must see or do before leaving Seattle? I think you can really appreciate Seattle if you come here during summertime and then take a walk to West Seattle and look back at Seattle, or it could be being on the ferry going to Bainbridge or something. It’s fairly easy to do here in Seattle, just go to different islands and different parts on a boat, and that’s something that’s unique about Seattle that you don’t really get to experience in any other city, and just looking back at Seattle is just pretty awesome, pretty amazing. Joule, 3506 Stone Way N (Wallingford); Asian fusion, dinner daily, brunch Saturday-Sunday. Revel and Quoin, 403 N. 36th Street (Fremont); Asian fusion, lunch Monday-Friday, dinner daily, brunch Saturday-Sunday. Trove, 500 E. Pike Street (Capitol Hill); Korean/fusion, lunch and dinner daily (noodle bar and parfait stand only), dinner only daily (BBQ), bar open daily. RockCreek Seafood & Spirits, 4300 Fremont Avenue N (Fremont); seafood, dinner daily, brunch Saturday-Sunday. The Whale Wins, 3506 Stone Way N (Wallingford); new American, dinner only daily. Manolin, 3621 Stone Way N (Fremont); seafood/Pacific Northwestern, dinner only Tuesday-Saturday, closed Sunday-Monday. Serious Pie, 316 Virginia Street (Belltown); pizza, lunch and dinner daily. Second location: 1124 Pike Street (Capitol Hill); lunch and dinner daily. Third location: Serious Pie & Biscuit, 401 Westlake Avenue N (Westlake); breakfast and lunch daily (for biscuits), lunch and dinner daily (for pizza). Cafe Besalu, 5909 24th Avenue NW (Ballard); cafe/bakery, breakfast and lunch Wednesday-Sunday, closed Monday-Tuesday. The Wandering Goose, 403 15th Avenue E (Capitol Hill); Southern, breakfast and lunch daily, dinner Friday. Mike’s Noodle House, 418 Maynard Avenue S (International District); Chinese, breakfast, lunch and dinner daily. Westward, 2501 N Northlake Way (Wallingford); Mediterranean, dinner daily, brunch Saturday-Sunday. Lark, 952 E Seneca Street (Capitol Hill); new American, dinner only daily. Ma’ono, 4437 California Avenue SW (West Seattle); Hawaiian, dinner daily, brunch Saturday-Sunday. Sushi Kappo Tamura, 2968 Eastlake Avenue East (Eastlake); Japanese, dinner daily, brunch Saturday-Sunday. Stateside, 300 E Pike Street (Capitol Hill); French/Vietnamese, lunch Monday-Friday, dinner daily. Monsoon, 615 19th Avenue E (Capitol Hill); Vietnamese, lunch Monday-Friday, dinner daily, brunch Saturday-Sunday. Second location: 10245 Main Street, Bellevue, WA; lunch Monday-Friday, dinner daily, brunch Saturday-Sunday. 전통설렁탕 (Traditional Korean Beef Soup), 22929 Highway 99, Edmonds, WA; Korean, breakfast, lunch and dinner daily. Mai Thaiku, 6705 Greenwood Avenue N (Phinney Ridge); Thai, lunch Saturday-Sunday, dinner daily. Beecher’s Handmade Cheese, Seattle-Tacoma International Airport, C gates; American/cheese shop, breakfast, lunch and dinner daily. Miller’s Guild, Hotel Max, 612 Stewart Street (Downtown); new American, breakfast and lunch Monday-Friday, dinner daily, brunch Saturday-Sunday. About the Chef: Rachel Yang recalls a memorable night she experienced as a culinary student, when she volunteered to work the James Beard Awards Gala at Lincoln Center. “[I still remember] just looking at these people and being in awe.” Nearly 15 years later, she and her husband, chef Seif Chirchi, will be attending next month’s gala, but not to work it. For the first time, they’ve been named a finalist for the James Beard Best Chef: Northwest Award.